Household saving is defined as income that is not consumed. Savings can be kept in cash form, saved in a bank account or saved in long-term assets, such as government bonds. Interest rates – higher interest rates makes saving more attractive. Economic growth – high growth and high consumer confidence encourages relatively higher spending and a fall in the savings ratio. The age of individuals – People in their 40s and 50s tend to save for retirement. Old people run savings down. Cultural trends – some cultures have stronger ‘saving culture’ – others pursue higher spending and borrowing. Wealth – Rising house prices increase household wealth and diminishes the need to save in other forms. Inflation – high inflation may discourage cash saving, but encourage the purchase of fixed assets. Saving ratio – the percentage of income that is saved. Higher interest rates mean that households will gain a higher rate of return on depositing savings in a bank. At interest rates of 1%, a £1,000 bank account, will only get £10 a year interest. If interest rates rise to 6%, then the interest payments will rise to £60 – giving a relatively higher return on savings. Ceteris paribus, higher interest rates should encourage saving. However, it is not straightforward – interest rates can be offset by other factors. For example, in the recession of 2009, interest rates were cut to 0.5%, but this did not reduce saving ratios, saving ratios increased because consumers were pessimistic about the future. The link between interest rates (base rates) and saving rates is limited at best. Also, there is an income and substitution effect. Higher interest rates make saving more attractive than consumption, but on the other hand, there is an income effect – if interest rates rise, then a saver can get their target interest payments with a lower level of savings. It is not certain that higher interest rates will encourage individuals to save more. 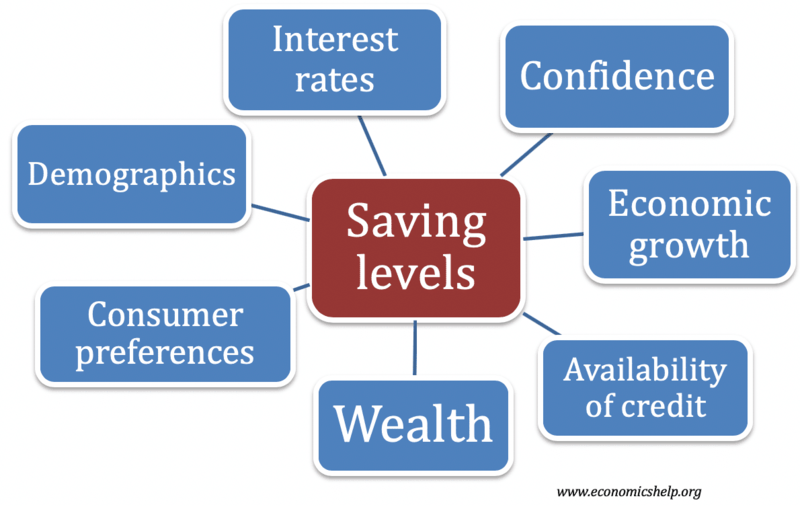 See more – How do interest rates affect saving levels? Also, another issue is the inflation rate. If interest rates are 15%, but inflation is 16%, then saving money in a bank gives a negative interest rate and there is less incentive to save. If interest rates are 3%, but inflation 0%, then there is a positive real interest rate of 3%. Rising income levels will lead to a rise in total saving levels. As households gain more disposable income and have the ability to save more. However, periods of economic growth can also create optimism and confidence amongst consumers and encourage a relatively higher percentage of consumption. When households expect rising incomes, then they are more likely to borrow to finance luxury goods and cut back on spending. 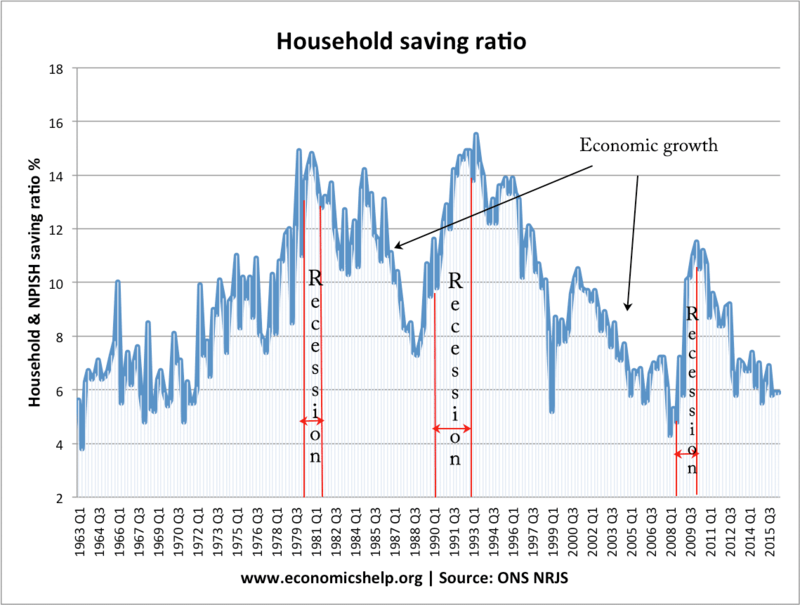 If we look at the UK household saving ratio, then it appears the saving ratio is cyclical. During the 1980s, the saving ratio fell during the “Lawson Boom” – but then rose during the 1990-92 recession. The saving ratio then fell during the long period of economic expansion (Great moderation). Then in the 2008/09 recession, the saving ratio shot up. This suggests that the economic cycle has a clear effect on the savings ratio – during a recession – the saving ratio rises – during growth, the saving ratio falls. Typically households on low income will have very low saving levels. They need to buy necessities and do not have the ‘luxury’ of being able to save. As incomes rise, households tend to have a higher marginal propensity to save. This is because with higher incomes there is a diminishing marginal utility to consumption – households with extra income are more likely to save it. If there is a rise in incomes of the low paid, this will have a bigger impact on increasing savings than if there is a rise in incomes of the wealthy. A reduction in inequality can increase saving levels. In a period of rising asset prices, households may feel less necessity to save. For example, a rise in house prices leads to an increase in wealth, that homeowners can access through mortgage equity withdrawal. In the 1980s and early 2000s, there was a significant rise in house prices which increased the wealth of homeowners – this gives households more confidence to reduce saving levels. Confidence and expectations of the future have a large bearing on saving. If households are optimistic about the future, they are more willing to borrow and run down savings. But, if confidence is low, then it is an incentive to save for unexpected problems. Factors that will influence economic confidence are closely related to the current economic climate, e.g. the rate of economic growth, unemployment levels, house prices. 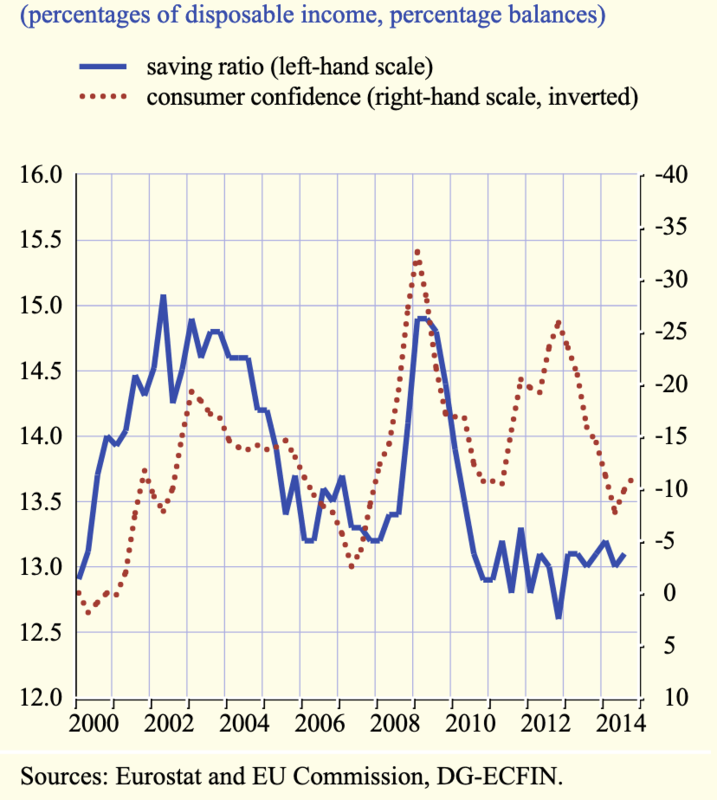 Data from the EU shows a strong link between consumer confidence and saving ratios. Life cycle theories of consumption argue that individuals try to smooth consumption over a lifetime. During a person’s student years, they will typically borrow (student loans), then in their 40s and 50s, with high income, they will save. Then during retirement, they will run down their savings. An ageing population can lead to a fall in the saving ratio. However, there is no guarantee that retired people will run down savings. They may wish to pass savings on to their children or feel they will live a very long time. Inflation can have an effect on saving. If there is high inflation – and if inflation is higher than interest rates, then this will discourage saving. Households may look to either spend money before it falls in value or buy assets which hold their value during inflation. 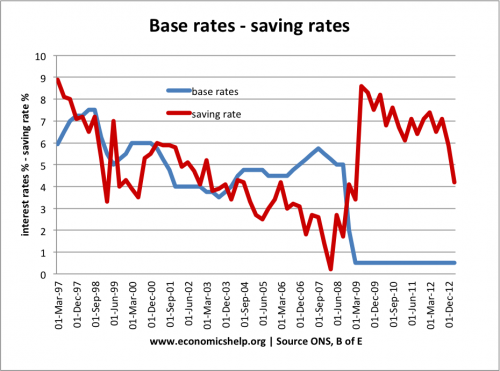 However, in the 1970s, inflation increased, yet the UK saving ratio rose. This is partly a reflection that towards the end of the 1970s, interest rates were increased to maintain a postive real interest rate. Also high inflation can create uncertainty and confusion and discourage consumers from taking risks such as taking out a loan. Inflation can be the uncertainty which encourages greater saving – so long as there are worthwhile places to save the money. Saving rates can vary between countries. It can reflect attitudes to borrowing, saving and social expectations. For example, thrift and saving can be seen as highly desirable in Germany – where there is greater aversion to debt. The UK has a greater willingness to borrow and run down savings.